The governess divulges to the reader the thoughts that were going through her head in the months following her realization that the Miles and Flora were conspiring against her. She believes the children know that she had seen Quint and Miss Jessel, and she believes further that the children know that she’s aware of their visits with the two ghosts. Whenever she tries to bring up the matter with the children, though, she stops short and instead discusses her own life with them. The governess begins to suspect that the children see the visitors when she does not, even when they are in the same room together. But—she thinks—they deliberately keep silent. The governess’s fear for the children’s safety here has transformed into a fear that they keep secrets from her about the time they spend with Miss Jessel and Quint. Yet her still lingering belief that they are innocent inhibits her ability to confront them honestly though, so her suspicions remain without substance. She seems to see them as both corrupt and innocent simultaneously. Miles and Flora eventually mention to the governess their concern that they had not heard from their uncle in a long time. The governess says she sees this as an opportunity to reconnect with the children, so she suggests to them that they write letters to him. She tells the children that their uncle probably would not respond, so she encourages them to write them as “literary exercises.” She says that she kept the letters, and still has them in her possession. The chapter concludes with her saying she never lost patience with the children. It is significant that the governess keeps the letters because this shows that she increasingly believes herself to be the only person who can protect the children, and this belief eventually intensifies to become a kind of overbearing and stifling attitude toward the children. Downes-Angus, John. "The Turn of the Screw Chapter 13." LitCharts. LitCharts LLC, 1 Dec 2013. Web. 24 Apr 2019. Downes-Angus, John. "The Turn of the Screw Chapter 13." LitCharts LLC, December 1, 2013. 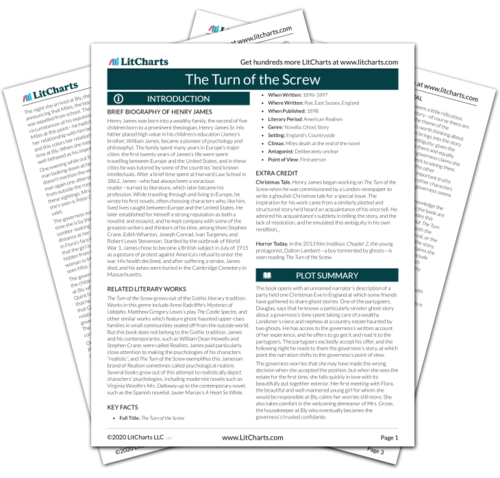 Retrieved April 24, 2019. https://www.litcharts.com/lit/the-turn-of-the-screw/chapter-13.